Our Penthouse Apartment Which Is Serviced By A Lift, Has Excellent Views Of The Golf Course And Pool Beneath, And Is Only A Short 3 Minute Stroll To The Hacienda And Resort Centre. 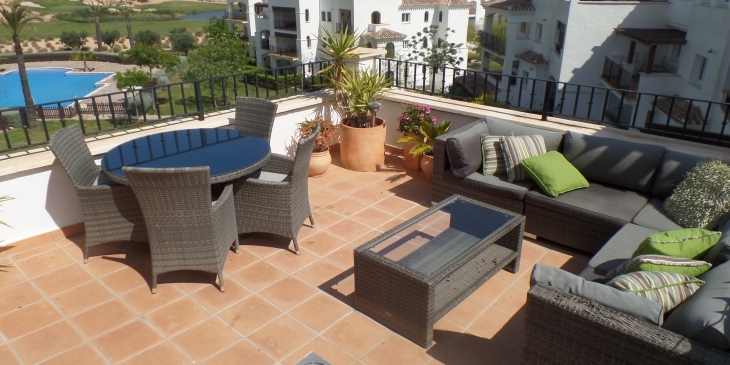 With The Private Roof Terrace Which Has Been Funished In High Quality Funiture, This Apartment Allows You To Really Make The Most Of The Spanish Weather All Within The Privacy Of Your Own Solarium. (Note: Some Penthouses Have Adjoining Terraces). It Also Boasts A Magnificent Barbacue For Outdoor Cooking And We Have Availabe, Four Sun Loungers To Take Down To The Pool Area. 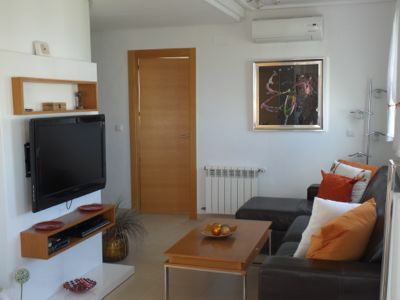 The Apartment Is Furnished In A Contemporary Style With A Luxury Leather Sofa In The Lounge With 32 Inch Tv/Satalite/English TV Channels Are Available/DVD/Air Conditioning/Free WiFi/ And With Dining Space For Four People. 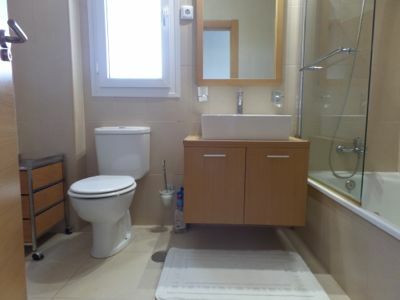 The Two Bedrooms Have Fitted Wardrobes And Consist Of Master Bedroom With Kingsize Bed And The Second Being A Twin. 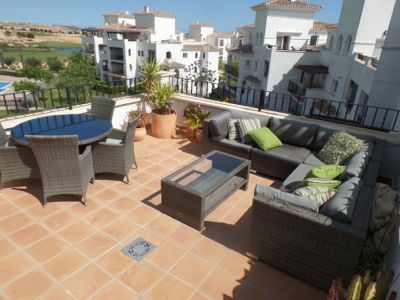 There Is Also A Terrace Off The Bedrooms With Seating For That Early Breakfast Or Late Drink With Views To The Hills. The Kitchen At Our Apartment Is Also Fully Equipped With All Of The Modern Appliances You Would Expect To Find Such As A Cooker, Fridge, Freezer, Microwave, Washing Machine, Kettle And Toaster. 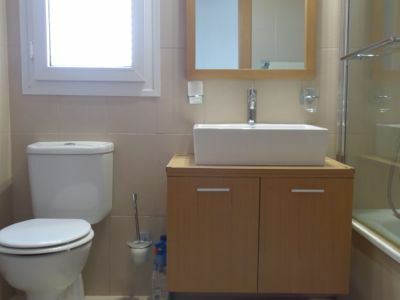 We Provide All Bed Linen And Towels For Use Within The Apartment And Provide Beach/pool Towels Also. There Are Generous Amounts Of Pools And Children’s Play Areas With The Nearest Pool Directly Below The Apartment. There Is A Sports Area With Tennis Courts, Paddle Courts And 5 Aside Football Pitch And Outdoor Gym. The Hacienda Facilities Include Bars, Restaraunt, Golf Pro Shop And An Excellent Supermarket. There Are Numerous Golf Courses In The Area. The 18 Hole Hacienda Riquelme Golf Course, Designed By Jack Nicklaus Is A Par 72 And 6416m Course Built To Professional Standards. The Course Covers An Area Of 71 Hectares And Has A Stunning Mountain Backdrop And Panoramic Views Of The Coast. This Course Is One Of A Group Of Six Golf Courses Owned By IRM (http://golf.marmenorresort.com/en) That Make Up Some Of The Best In Europe. They Are The Mar Menor, La Torre, Saurines, Hacienda Riquelme, El Valle And Alhama. Hacienda Is Different From The Others, Providing Ample Fairways Combined With Hard To Approach Greens, And Bunkers Ready To Challenge Your Game. The Course Is Surrounded By Wild Flowers, Olive Trees And Stunning Lakes. Other Golfing Amenities Include A Driving Range And Pro-golf Shop On The Resort. 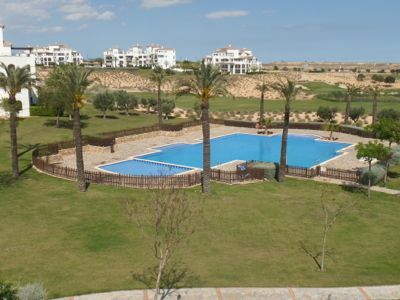 Whilst Staying At Hacienda Riquelme You Are Able To Use The Amenities And Play At Reduced Rates At La Torre Golf Course, El Valle Golf Course Or Mar Menor Golf Course. A Shuttle Bus Provides Transport For Golfers And Holidaymakers To And From These Resorts. We Also Offer Our Guests The Following Services: ( Please Enquire At Point Of Booking For Costs) Airport Transfers, Welcome Packs.